Thermal energy storage market is gaining remarkable momentum lately as renewable energy sources gain a greater foothold in the energy system and the energy generated using renewable sources become a top priority if greenhouse gases emission is to be brought down to zero. All over the world, an immense effort is being put into the shifting away from traditional baseload energy sources, both by private and public entities, which has led to the development of efficient energy storage systems. Thermal energy storage market has benefitted from such efforts as it is one of the most cost effective and efficient methods of energy storage. The change in the energy mix that has been evident in greater or lesser degree all over the world and can be clearly demonstrated with the figures collected by the U.S. Energy Information Administration. For instance, fossil fuel production has fallen by 7% between 2015 to 2016 with coal production lower by almost 18%. During the same time period even natural gas production fell by 2% in spite of the shell boom. Renewable energy production in the other hand rose by 7% with solar and wind energy accounting for approximately quarter of the increase. But considering that energy is required 24 hours of the day even when the sun is not shining, or the wind is not blowing has acted as a powerful driving force for the development of more efficient energy storage technologies such as lithium ion batteries or pumped hydro. Thermal energy storage mainly comes to play a role in strengthening the concentrated solar power (CSP) applications where thermal energy storage enables a project to produce electricity well after the sun has gone down. As photovoltaic prices have begun falling sharply, CSP had a harder time keeping up with the competition but as CSP brought the unique thermal energy storage capabilities to the table, it has come to regain some of its lost ground. And with the growing demand for CSP that has the potential to become a base load generation source when combined with thermal energy storage system, the thermal energy storage industry is also gaining immense traction, a trend that is expected to intensify over the coming years. Crescent Dunes project in Nevada developed by SolarReserve is one of the most prominent instances of a CSP plant could run 24 hours a day. The 110-MW Crescent Dunes power tower has 10 hours of storage. SolarReserve is also developing a 100-MW Redstone power tower project that is due in 2020 and will have 12 hours of storage while a 260 MW Copiapo plant, scheduled to be operational in 2022 will have 13 hours of storage. These thermal energy storage systems use molten salt as their medium of storage and molten salt has been found to surpass battery storage in its capacity to store energy, as per the International Renewable Energy Agency. Remarkably, molten salt thermal energy storage market, in 2017 was valued over $9 billion and is estimated to account for three-fourth of the thermal energy storage deployed for electricity applications across the world. In a report compiled by the U.S. Department of Energy it was depicted that molten salt energy storage volumes beat those of batteries by mid-2017. In terms of energy, the storage capabilities are evidently massive and some of the upcoming projects are good enough to dwarf Crescent Dunes. 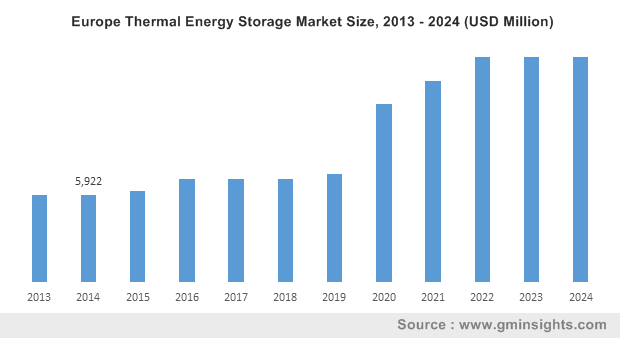 Thermal energy storage market has found to be gaining significant boost in Chile, Australia, the Middle East and South Africa where the government has mandated the attachment of such levels of storage with CSP. California, with its target of reaching 50% renewable energy by 2030 has also come to acknowledge the benefits of bulk storage offered by molten salt thermal energy storage facilities. However the biggest molten salt thermal energy storage market will possibly be China which has a massive energy demand and is taking major interest in CSP development. China is in fact planning 1.3 GW of capacity across 21 projects and has joined forces with companies in the Middle East to realize the development. One of the chief problems that might stand in the way of the growth of thermal energy storage market is the developmental cost of CSP, which is much more than that of wind or solar projects. But experts opine that if the technological advancement is able to do for CSP what it has have done for PV, which has drastically lowered the cost of solar PV cells and has thus made solar energy more affordable, thermal energy can surpass other forms of energy as a base load.